Cabins and Horseback Trail Rides in MO. Come relax and stay in a lovely cabin while experiencing gaited horseback trail riding through Missouri's Ozark hills and valleys and along the banks of the pristine Upper Meramec River. Ride for an hour or for days. Numerous horseback riding trails grace the countryside near our working family farm, nestled in the Missouri Ozark Highlands. You will find that each season offers spectacular beauty and an abundance of nature-related activities and trailrides. OR RIDE ONE OF OURS! Meramec River Cabins and Gaited Horseback Trail Riding Vacations in Missouri. GIFT CERTIFICATES available, give the gift of a memory that lasts forever, some special time away from the routine amidst Nature and the Upper Meramec River. Call or Email us to get yours! and Credit or Debit Card. Bring your own steed or ride our Missouri Fox Trotter, Tennessee Walker or Peruvian Paso horses. 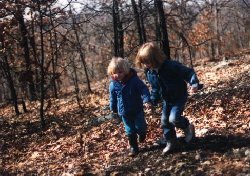 Your hosts provide family-friendly lodging in Missouri and just the right amount of involvement to make your visit as tranquil or adventurous as you wish. This unique getaway is only an hour's drive from Saint Louis Missouri. then return here and make payment to LOCK IN your reservation! THEN USE ONE OF THE BUTTONS BELOW TO PAY NOW AND LOCK IN YOUR RESERVATION. $80 for 2 persons, $10 for each additional person, 1 night free for a 7 night stay. 5 acre gravel bar and many places to swim/access the river from the farm. 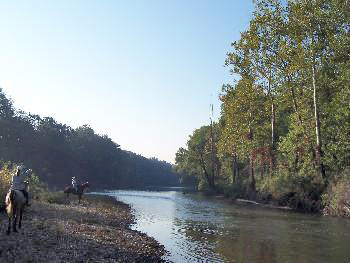 The 470-acre Meramec Farm is located on a bend of the beautiful, spring-fed Meramec River. It's truly a setting for all seasons--meadows graced with wildflowers in the spring, summer respites in cool caves within the towering Vilander bluffs, wooded hillsides splashed with autumn's red, orange and gold, and winter's intimate stillness after a snowfall. No matter what the season, Meramec Farm is a place for peace and discovery, far away from the pressures of everyday life. Meramec Farm is horse friendly. With advance notice, guests may bring their own horses. Many special rides are available on gaited breeds, on our farm and nearby farms and trails. We have Missouri Fox Trotter, Tennessee Walker and Peruvian Paso breeds for your trailriding enjoyment. Carol will help make the arrangements and is often available to lead the tour. Plan a weekend - or longer - in one of our two private Missouri guest cabins. At Meramec Farm, spring inspires leisurely walks amid wildflowers, picnics, and afternoons spent fishing in the stocked ponds or river. 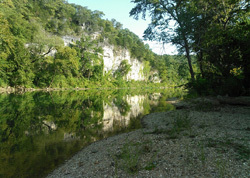 Summer means swimming in the clear, cool water of the Meramec, or spelunking in nearby caves. Autumn's dazzling weather invites hiking and bicycling. And winter offers cross-country skiing and ice skating. Miles of trails climb the rugged bluffs and wooded hills, cross open fields and follow the rivers course. The high panoramas and river views are magnificent! Wildlife abounds at Meramec Farm. The woods are home to wild turkey, white-tailed deer and many other native Missouri animals. Great Blue Herons nest in the sycamores. Bass and trout flourish in the Meramec River and nearby streams. Since Meramec Farm is a working farm, animals considerably less wild are usually about, much to the delight of children and guests of all ages who visit the farm. Grazing cattle, frolicking calves, horses, foals, mules, chickens, cats and dogs make their home here. 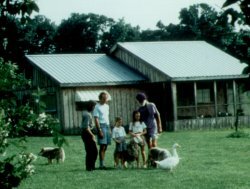 Meramec Farm has been welcoming guests since 1982. But its been a working farm since 1811, when William Harrison left Kentucky, swam his cattle across the Mississippi and started his new farm on the Meramec River. During its more than 180 years, Meramec Farm has remained in the same family. 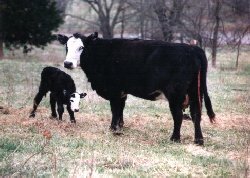 Today, the sixth and seventh generations of that family, raise cattle and hay, proudly continuing the family farm tradition.